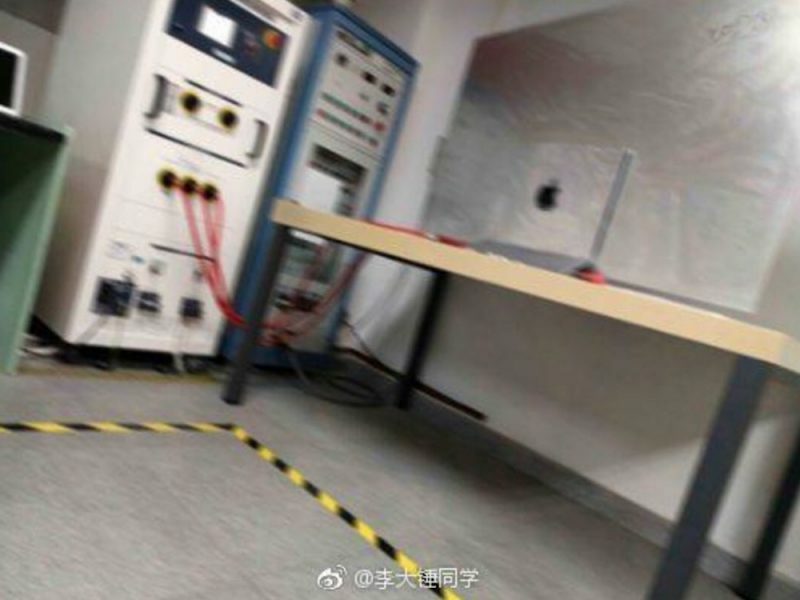 Blurred images emerged online on Wednesday morning purporting to show what looks like an Apple-made standalone display in a specially prepared testing environment. The images were posted on Chinese microblogging site Weibo and later picked up by mobile leaker Benjamin Geskin and shared on Twitter. 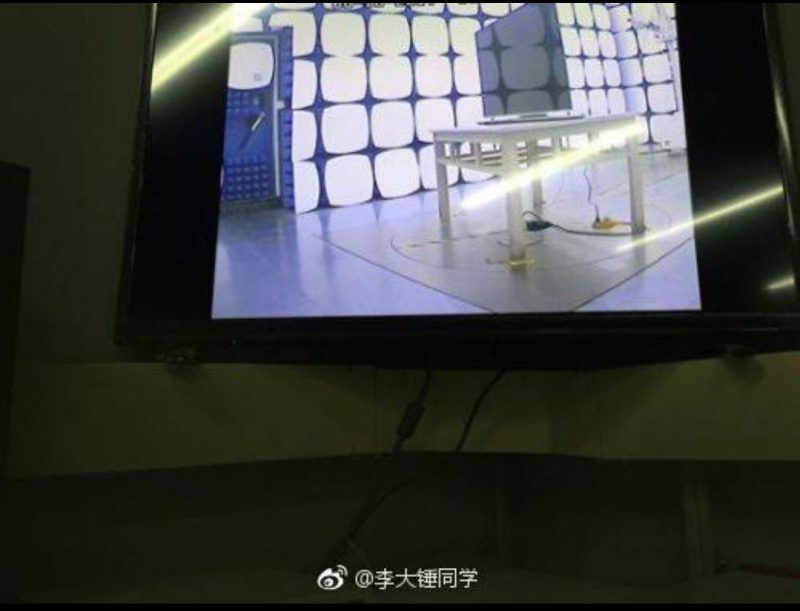 A Google translation reveals that the original Weibo post refers to the pictures as "Apple OLED TV spy photos", and claims that the display is "about 60 inches" with a narrow frame design and a metal shell. 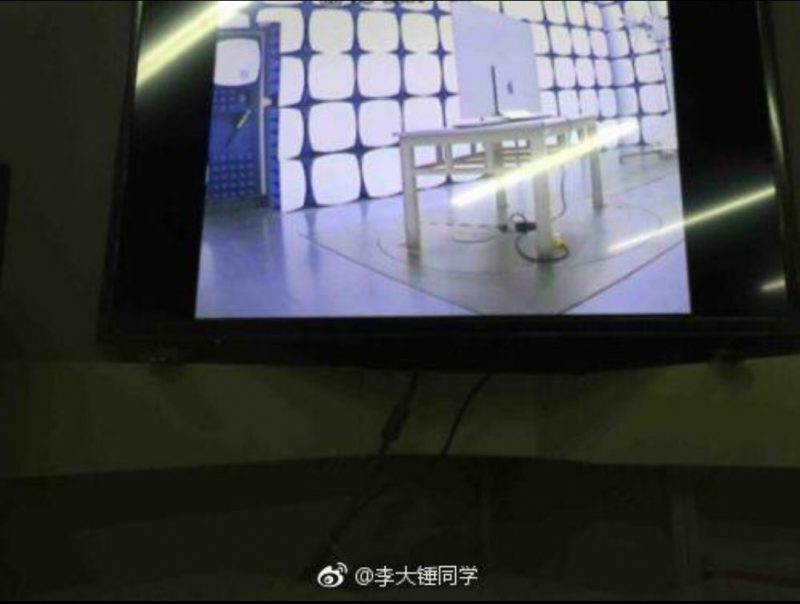 The first two photos show a closed-circuit TV screen outputting front and rear camera angles of the alleged Apple television mounted on a rotating test bed in the center of an acoustically insulated room, with connecting cables running down a table into the floor. While the original Weibo post notes that two black spots at the bottom of the screen depict a camera, these aren't visible in the photos. 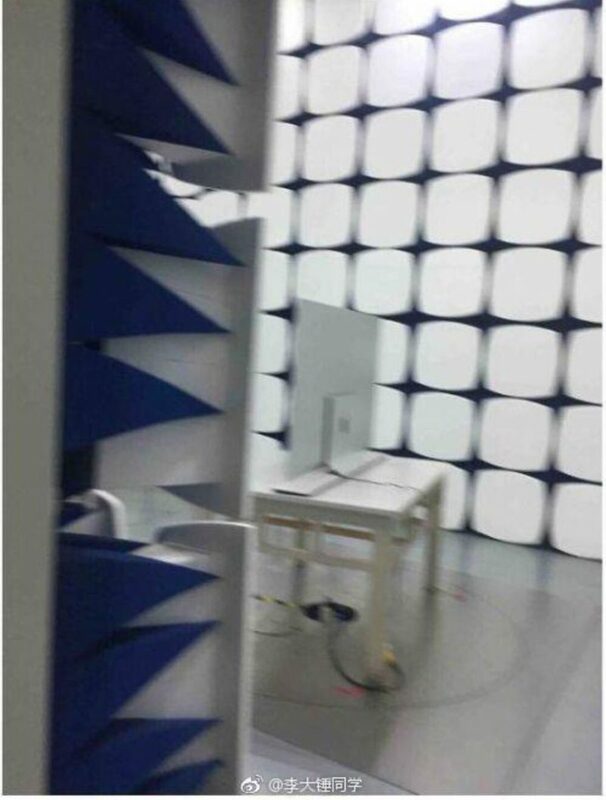 A third image appears to be taken from the door shown in the previous two images, while a fourth photo, below, shows what looks like the same display from a different angle, connected by orange cables to large unidentified testing equipment. It's virtually impossible to say anything definitive about the contents of the photos, and Apple is known to regularly test devices most of which never see the light of day as consumer products. As far as Apple-branded television rumors go, these had been circulating for years before a Wall Street Journal report two years ago essentially confirmed that Apple had shelved its TV set plans back in 2014. The company reportedly spent more than a decade researching the possibility of releasing an ultra high-definition television set before deciding to cancel the project because it couldn't find untapped features that would give it an edge in the television market. Apple is rumored to be working on a fifth-generation Apple TV box that's able to stream ultra high-definition 4K video and it may well launch this year, so whether or not this could see Cupertino revive its plans for an accompanying or integrated television set remains to be seen. Discounting the "60 inches" reference in the Weibo post, this leaves the possibility of an Apple-branded external computer monitor. Apple discontinued its nearly five-year-old Thunderbolt Display in 2016, but the company is said to be working on a "pro" display to accompany a future Mac Pro machine due next year. 4K and 5K LG Displays are already available from Apple, but these don't fit with Apple's usual aesthetic and have been prone to issues. Whatever the origin of these photos, it's best to take them with a grain of salt, for now at least. Update: Less blurry versions of the images were posted to our forums earlier this week, with multiple related forum accounts suspiciously created to discuss the photos before the discussion thread was deleted. Forum member brock2621 also found some suspicious artifacts in the images. I knew I'd seen that room before.. This was posted yesterday in the forums and I took it into photoshop and found it was faked (there was a box over the apple logo). It looks like the poster actually deleted the entire original thread and then took the photos and blurred them a ton MORE and reposted them to try and hide the fact it was faked. The ones posted yesterday were much more clear. Introducing the new Apple Cinema Display. Again. Top Tip: If you are going to sneak into an Apple lab and take pictures, take a decent camera! Love the "fact" that even when they are super early in prototyping, they still manage to put a clear and easy to recognize Apple logo on the back. Right in the middle of it. If you invert the colors on your iPhone and look carefully in the reflection of the second photo you can see an faint image of SJ. Oh God... Now they are getting into TV? Can't think of why they would get themselves into such a saturated market. This will certainly mean the comeback of Gene Munster.